The flower fountain nozzle has lots of holes to jet water, so it is also called flower-basket nozzle. Its shooting water pattern seems like a beautiful and attractive bouquet of flowers. Moreover, it's easy and convenient to install, and it is quite suitable for fountains built for different purposes. As a professional manufacturer of flower fountain nozzle in China, Guangzhou Water Art Fountain Irrigation Garden Co., Ltd also provide many other water fountains, water features and fountain nozzles for clients around the world, including music fountain, programmed animated fountain, garden fountain, square fountain, scenic fountain, artificial fog fountain, waterfall rockery, sculpture fountain, floating fountain, running fountain, wall fountain, creek water feature, outdoor water fountain, direct jet nozzle, dandelion fountain nozzle, rotary nozzle, flat nozzle, fan nozzle, water sphere and hemisphere nozzle, aerated nozzle, spring nozzle, etc. For all of our products, lifelong maintenance is available. We have built up lifelong cooperative relationship with customers from Malaysia, Brunei, Tajikistan, Saudi Arabia, UAE (United Arab Emirates), and many other countries in Central Asia and Southeast Asia. If you need our flower basket nozzle, please do not hesitate to contact us. Dandelion Fountain NozzleThe dandelion fountain nozzle can fall into two types: dandelion fountain nozzle and semi-spherical dandelion fountain nozzle. 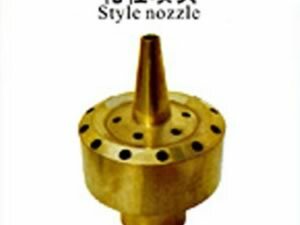 Rotary NozzleThe rotary nozzle is capable of rotating by making use of the centrifugal function and reaction force of water flow. Because the bending directions and inclination angle of nozzle tubes are different, this rotary nozzle can form beautiful water patterns.